I haven't been on quite a shopping kick lately, which is odd for me considering it's a new season so that means all new clothes, right!! But I did pick up a few key pieces that I have a feeling will be on constant rotation through out the fall season. Monogrammed Necklace Rain Boots Cardigan Blazer Booties Blanket Scarf The monogrammed necklace my husband actually purchased for me after I kept hinting I wanted one. I got it in silver with my new initials aMm. The rain boots I purchased on a whim from 6pm.com since they were at a much lower price them department stores and through hunter. I'm thankful for this purchase since we are having downpours all week. Plus I find the shorter ones are much easier to drive in then the tall ones. 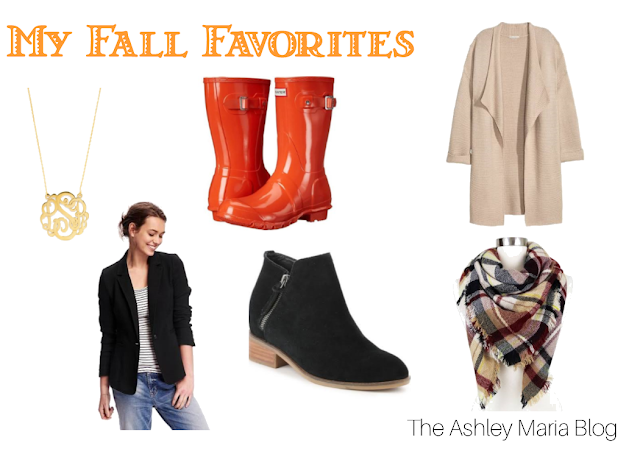 Some of the other things I purchased are just staples to wear to work, date nights and even those chilly football games! What are some fall pieces you picked up already or plan to?